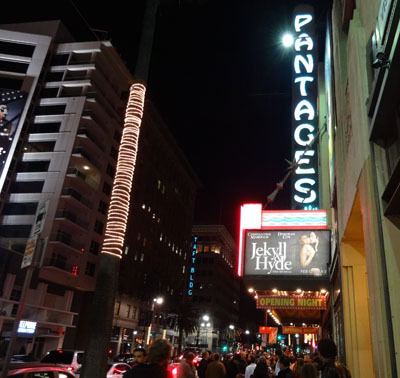 Jekyll & Hyde Opening Night at the Pantages in Los Angeles, California! Opening Night at the Pantages! I’ve seen many shows at the Pantages Theatre in Los Angeles, but I’d never made any special effort to attend on opening night. On February 12th, 2013, I got the chance to find out what I’d been missing when I attended the opening night performance of Jekyll & Hyde. When I arrived, about an hour before showtime, the area just outside the theater was buzzing. A red carpet ran opposite the box office. Celebrities chatted with reporters, photographers snapped pictures, and theater guests stood just behind the paparazzi snapping photos with their cell phones. 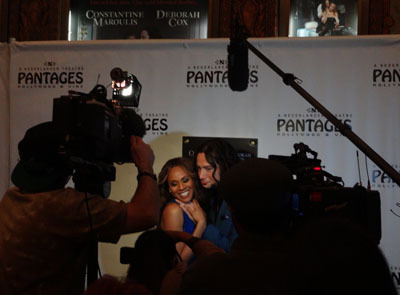 I watched the stars of the show, Constantine Maroulis and Deborah Cox, talk to reporters and pose for photos. 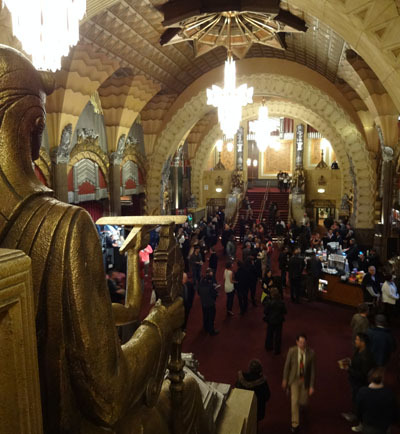 As showtime approached, my friend and I showed our tickets to an usher and slipped inside the gorgeous Pantages Theatre lobby. I saw Glee’s Lauren Potter, and I watched Cox make her way through the lobby, heading backstage. At intermission, I spotted more famous faces in the lobby. American Idol vocal coaches Peisha McPhee and Michael Orland (Orland coached Maroulis when he was a contestant on season four of Idol) chatted with adorable former American Idol contestants turned happy couple Diana DeGarmo and Ace Young. After the show, there was a wonderful photo-op for theater guests who dream of walking the red carpet. The Pantages Theatre staff had left the red carpet in place and even had helpful ushers available to snap photos with guests’ cell phones or cameras. And so, even through I am not a celebrity, I left with a photo of myself on the Pantages’ red carpet! Read Jen's review of Jekyll & Hyde here. * Jen attended this performance of Jekyll & Hyde as a member of the press.